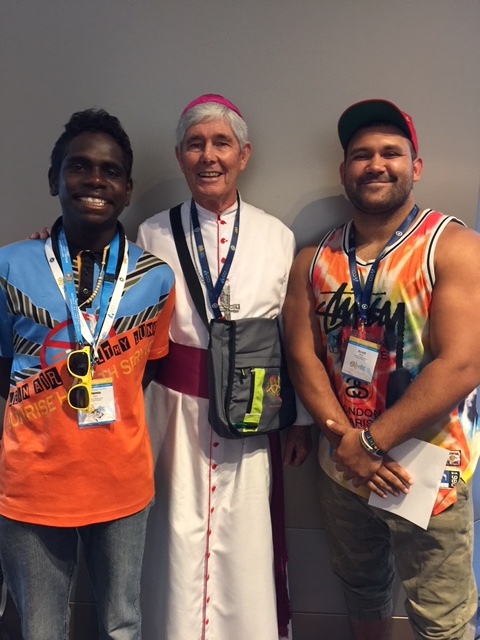 Bishop Hurley with young people from the Darwin Diocese. It was a rare occasion to see a diverse group of young people dine with a large number of bishops during an informal dinner at the Australian Catholic Youth Festival on Friday 4 December last. 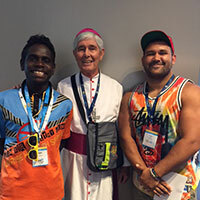 The gathering was a unique opportunity for the Australian bishops and young people to chat and laugh together. 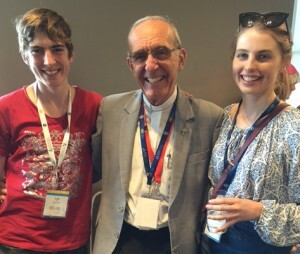 ‘It is awesome to have this time to meet the bishops face to face in a relaxed way and to meet other young Catholic people like me from all across Australia’, said one young woman from Brisbane. Archbishop Fisher, Bishops Delegate for Youth, spoke at the event encouraging youth to, ‘be the gift of new life that the Church needs today’. 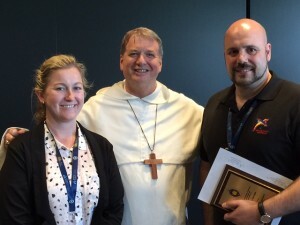 During the gathering, Malcolm Hart, Director of the Australian Catholic Bishops Conference, Office for Youth, thanked the Australian Catholic Youth Council for their energy and commitment to developing youth ministry at a national level. Malcolm drew particular attention to retiring council member, Teresa Rhynehart (nee Wilson), Archdiocese of Melbourne, for nine years of service to the Youth Council. 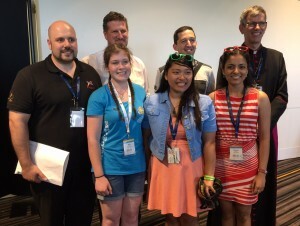 Teresa chaired the Australian Catholic Youth Festival 2015 steering committee. Bishop Bianchini and young people from the Diocese of Geraldton. Following the change in membership of the bishops’ commissions during the plenary meeting in May 2015, a subsequent change is now taking place in the membership of the bishops advisory councils. Four members of the Youth Council have completed their terms and the Bishops Commission for Family, Youth and Life has appointed four new members of the Council. Archbishop Fisher presented a plaque as a token of appreciation to three outgoing members who had served nine years on the Council; Fr Christian Fini OMI, Archdiocese of Melbourne, Yvette Nehme, Maronite Eparchy in Sydney, and Teresa Rhynehart, Archdiocese of Melbourne. Shawn van der Linden, Archdiocese of Canberra-Goulburn who is stepping down from the Council, was also acknowledged. Fr Christian Fini OMI, Fr Chris Ryan MGL and Bishop Mark Edwards OMI with young people from the Archdiocese of Melbourne. Archbishop Fisher welcomed the newly appointed council members; Patrick Langrell, Archdiocese of Sydney, Cassandra Bull, Archdiocese of Brisbane, Shawn Torbey, Maronite Eparchy in Brisbane, and David Cloran, Archdiocese of Sydney. The Bishops’ Delegate for Youth thanked the new ongoing and outgoing councillors for their willingness to share their experience and talents with the Youth Council. This entry was posted in Uncategorized on December 10, 2015 by ACBC Communications.